The Doll Factory releases Weightless, Premonition E.P., and for the first time, a single version of the band’s cover of …Baby One More Time are now available (once more) from digital download, subscription, and streaming outlets including iTunes, Apple Music, Tidal, Spotify, Pandora, Rhapsody, eMusic, CDBaby, and more. The Loyal Oppostion ‘Under the State’ – out now! 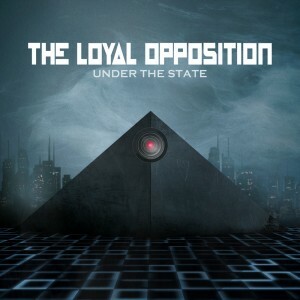 ‘Under the State’, the new album from The Loyal Opposition, is a collaborative side project concept album from Jason Bazinet (SMP, Front Line Assembly, 16 Volt, Chemlab) and Garrick Antikajian (Doll Factory, SMP, micro/nism, Guernica), with Doll Factory’s Chris Roy on guitars, backing vox, and mastering. Co-produced by Chris DeMarcus (who has worked with Stiff Valentine, Left Spine Down, Front Line Assembly, Aesthetic Perfection, Chemlab, 16 Volt, Jewel, Marcy’s Playground, Tal Bachman, and many more) and The Loyal Opposition. ‘Under the State’ will be available from a wide selection of online retailers very soon. While the official release date is July 17, you can grab it on iTunes and CDBaby.com today! …on 89.5 FM Seattle’s Sunday evening “On The Edge” programme. In addition to the Blackpool Astronomy remix, DJ Paul Aleinikoff has also been spinning C’est la Mort’s “Among the Ruins (Doll Factory remix)” regularly since its release. The new C’est la Mort release, In the Soft Focus Light of I Love You, is a limited edition remix disc featuring remixes of songs from their debut full-length, Empty Words Fill Lonely Spaces, including “Among the Ruins (Doll Factory Mix)”. Available now direct from the band at cestlamort.com. Listen to a free preview of “Among the Ruins (Doll Factory Mix)” at the site. Dragged kicking and screaming into the 21st century, Doll Factory now has a free “widget” thingamabob that streams audio, links to our stuff on iTunes, aggregates Twitter “tweets” from twitter.com/dollfactoryband, and serves “virtual” buttered toast with your choice of lemon curd or a delightful spiced apricot conserve. To add the above Doll Factory “widget” to your Web page, Facebook, Friendster, MySpace, blog, or iGoogle, hover your mouse over the widget and click the “Share This Widget” or “Menu” buttons. Buttered toast not available in all areas. Yes, we’re still here. Just rather busy with that whole “life” thing – getting married, having babies, moving from the west coast to the east and back, organic gardening, volunteering for elections, painting, cooking, cleaning, traveling to Europe and Japan and such. Stay tuned for new music, videos, and maybe even live shows again (but probably not until a year from now on the latter). Cheers! Several tracks from Weightless and Premonition E.P. are now available as “iTunes Plus” higher-definition, DRM-free tracks and iPhone-ready ringtones from Apple’s iTunes Store. We’re not sure why some tracks from each release are ‘enabled’ as ringtones, but not others, and it’s functionally impossible for indie artists to contact Apple directly and ask, but hey, we’re not complaining. Chris from Doll Factory will be at the Fez Ballroom (316 Southwest 11th, Portland, Oregon USA) on November 3rd, 2007, spinning whatever he damn well pleases (stuff like Interpol, Ladytron, IAMX, Editors, Ima Robot, Alpinestars, LCD Soundsystem, and the like, plus a bit of Bollywood, left-of-center electronic cuts, and plenty of dusty old post-punk and batcave tracks) in one room, while Jill Tracy, Paul Mercer, Lance Coombs, and (?) ‘guests’ perform live, cabaret-style sets in the other. Doors at 9pm, and (sorry) 21+ only.